Fires are a leading cause of injuries, death and property damage in the United States and in the world. According to the World Health Organization, some 265,000 people die worldwide due to fire-related incidents. The State of Alabama Fire Marshall’s office often records in excess of 100 fire-related deaths in Alabama on an annual basis. Unfortunately, many of these deaths and injuries were preventable. The Alabama accident and injury attorneys at Hollis Wright have successfully represented many clients who were catastrophically injured or lost family members due to fires that could have been prevented, detected earlier, or extinguished faster. According to the World Health Organization, non-fatal burns that result in hospitalization are the leading cause of morbidity, disfigurement and disability. For this reason, it is of utmost importance that you seek medical attention first and then seek the advice of an attorney should you suffer from a burn or fire-related injury. Please click here for more information about the different types or degrees of burn injuries and how medical personnel will likely treat the injuries. There are many different types of legal theories associated with fire-related incidents. Some fires are the result of defective products, improper electrical work or substandard installation of appliances and equipment. Fires can start as a result of failing to maintain certain equipment. Also, while some fires start accidentally, smoke detectors and fire alarms don’t work and can give rise to legal claims for failing to give proper notice of a fire. Those who own hotels and apartment complexes are particularly vulnerable to litigation arising from fires. Owners of hotels and apartments have a legal duty to provide certain fire protection measures. For this reason, they can be held liable for injuries that occur as a result of failing to provide these required protections. Depending on the type of fire, how it spreads, and how long it takes to burn, there may be viable claims for failing to provide early notification through a smoke alarm or smoke detector. Also, owners of apartments and hotels can be held liable for failing to have adequate means of exiting the building when a fire is present. 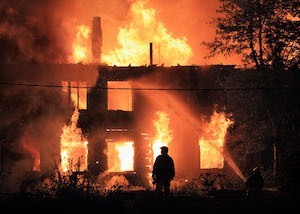 Investigating the scene of a fire when the cause and origin are initially unknown, is important in order to pinpoint any and all potential causes and sources of the fire. Occasionally, potential fire sources are overlooked or prematurely dismissed, resulting in the cause being undetermined. If a determination cannot be made as to the cause or origin of a fire, it may be impossible to pursue a claim for personal injuries or death. Our attorneys are highly skilled and are familiar with the latest fire science technologies, including computer fire modeling and forensic toxicological analysis. Hollis Wright routinely employs experts in fire cause and origin to investigate scenes and make determinations as to the cause of the fire and where the fire started. Additionally, these experts help identify the critical pieces of evidence that need to be gathered and preserved at the fire scene. Every fire scene possesses crucial evidence that can assist the attorney in proving a case on behalf of an injured victim. This evidence will be destroyed as part of a fire clean-up effort if it is not preserved immediately. Hollis Wright is currently reviewing and representing clients who were injured or killed in several fire-related incidents. If you or a loved one has been affected by a fire, it is important to consult with an attorney quickly due to the complicated nature of these cases. Securing evidence in a fire-related case is crucial and time sensitive. Each case includes many potential legal theories to be evaluated and considered. Injured fire survivors may face a lifetime of pain, suffering and permanent disfigurement. Depending on the degree of the burn injuries, the burn scars can be devastating to a person’s physical appearance and to their self-esteem. It is of the utmost importance that victims of a fire or burn injury seek medical attention as soon as possible and remain in contact with the physician for treatment. Burns are a very specific injury and need special care. Additionally, your attorneys will need full and ongoing documentation of the severity and progress of your injuries. Such documentation will help in building a successful case and ensure you receive the compensation you deserve. The attorneys at Hollis Wright have years of experience in this area of the law and are well-equipped to help you obtain the compensation that you deserve. We represent clients on a contingency fee basis which means that we don’t get paid unless we successfully recover money on your behalf. Should you need representation due to damage or injury caused by a fire, we can help with your claim or case. Call us at 205.324.3600 or 1.844.LAW.TALK if you have a fire-related, or any personal injury claim you would like us to review. You may also contact us here.